From the name itself, the workshop will re-introduce the most basic of all techniques in watercolor paintings: washes, lifts, dry brush and wet on wet technique. 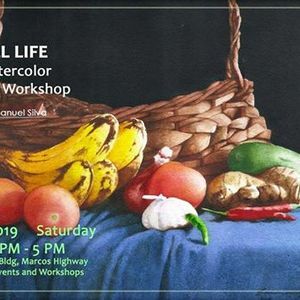 The workshop's primary focus is to enhance the basic skills of each participant in understanding the importance of tonal values in watercolor painting, how it will be relevant to creating a piece, and how to control proper loading of paint vs water and familiarizing one's self with paper and wet paint application. Each participant will be learning the correct way of loading water and amount of paint to achieve desired results and controlling the moisture of paper. This workshop is open to beginners 11 yrs old above. For questions please message us!